Kiwi kids have long made their own fun, and playing in the bush has been a common pastime for generations. However, urbanisation and safety concerns mean that children are generally more closely supervised in their play than they once were. While most toys are imported, the New Zealand-designed Buzzy Bee remains iconic. Traditionally, Māori children had hand-made toys such as darts and kites. They played string and stick games and swung on swings. Exploring the bush, hunting and fishing were other pastimes. After the arrival of Europeans many traditional games disappeared. The children of European settlers, who arrived from the late 1830s, were generally expected to work with their families. They had to fit play in around chores, playing games of imagination and adventure in farmland, bush or streets. Girls were expected to play quieter, more ‘ladylike’ games. From 1877 schooling became compulsory from ages seven to 13. School playgrounds were often separated into boys’ and girls’ areas. By 1900 children weren’t generally expected to do so much work. To avoid them getting into mischief sports teams were set up, especially for boys. Scouts and Girl Guides began in New Zealand in 1908. In the 2000s films, radio, television and computer games altered how children played and gave them new storylines for imaginative games. New toys, such as model cars and Barbie dolls, were advertised through television. The journey to school was an opportunity for children to race each other, on foot, horseback or on bikes. Boys used to (and still do) play rough games such as fighting and bullrush. Both boys and girls played rounders, where a batter hits a ball and then runs between bases. Since the 19th century girls have played games with singing and rhyming chants, such as ‘London Bridge is falling down’ and elastics (a jumping game that involves a tied length of elastic). Chasing games such as tag or stiff candles have also been popular. 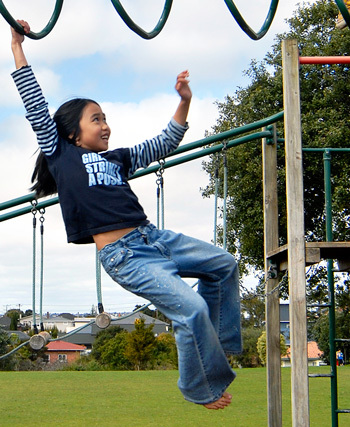 Children in New Zealand have always had the great outdoors to play in, while urban children have sometimes played in city or town streets. Since the late 20th century there has been more adult supervision because of safety concerns. Playgrounds were built in schools from the 1880s, and public playgrounds were built from the 1890s. Māori children had a range of toys including tops, hoops, kites and puppets. Settler children’s toys, such as model boats or rag dolls, were also generally homemade. By the 1860s there were toy shops around the country, which mainly sold imported toys. There were some New Zealand toy manufacturers, and one iconic New Zealand toy is the Buzzy Bee. In the 20th century toys became mass produced and New Zealand children joined global toy crazes for products such as Barbie dolls and Lego.